Research - Micro Mechanical System Technology Lab. Micro-Electric-Mechanical System, or MEMS, is the technology of very small mechanical devices driven by electrical or mechanical system. MEMS are made up of components between 1 to 100 micrometers in size (0.001 to 0.1 mm). Micro-scale devices are fabricated using modified semiconductor device fabrication technologies, including molding and plating, wet etching (KOH, TMAH) and dry etching (RIE and DRIE), and surface micro-machining. Like integrated circuits, MEMS fabrication technology utilizes many materials such as silicon, polymers, metals and ceramics. Processes include deposition of materials on silicon wafers, patterning with ultra-violet or X-ray photolithography, and etching in solution or plasma gas. MEMS technology has many applications in sensor, actuator and micro-structures: inkjet printer, accelerometers, gyroscope, pressure sensor, microphone, optical micro-mirror, fluid channel, etc. Through various silicon microfabrication techniques, we create microstructures that are used in countless applications and also micro-devices such as high performance sensors and actuators. Recent work encompasses the design, optimization, and effective realization of high performance MEMS devices, as well as the integration of various types of sensors. Transparent electrodes are key elements in optoelectronic devices such as touch panels, organic solar cells, organic light emitting diodes, smart windows, and transparent heaters. They require high optical transmittance and low sheet resistance, which are determined by the materials, fabrication process, and pattern design used. Metal mesh is comprised of microscale patterns consisting of metal such as gold, silver, or copper. The design of the mesh pattern, which is expressed as the line width, pitch, and height, enables adjustments to its performance. The metal mesh is fabricated by using UV embossing and doctor blading process. These processes are relatively simple and do not require high temperature, vacuum environment, and expensive facilities. 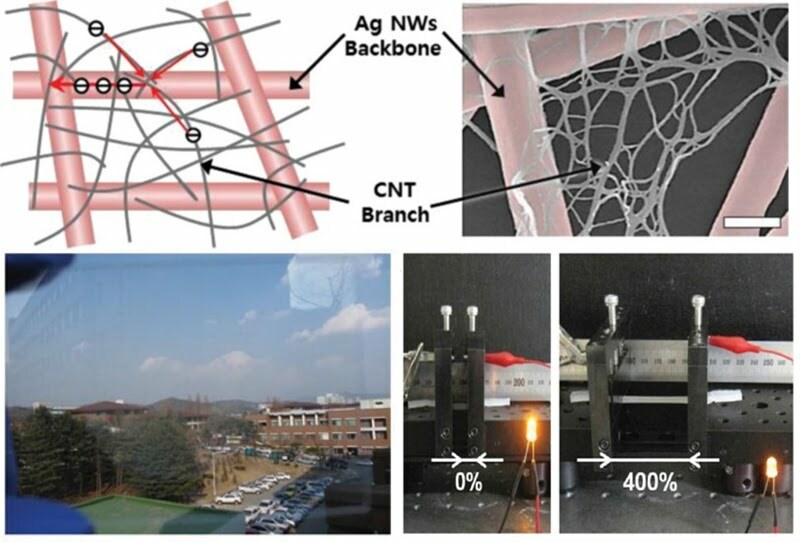 The hybrid nanocomposite combines the enhanced mechanical compliance, electrical conductivity, and optical transparency of small CNTs (d ≈ 1.2 nm) and the enhanced electrical conductivity of relatively bigger Ag nanowire (d ≈ 150 nm) backbone to provide efficient multiscale electron transport path with Ag nanowire current backbone collector and local CNT percolation network. 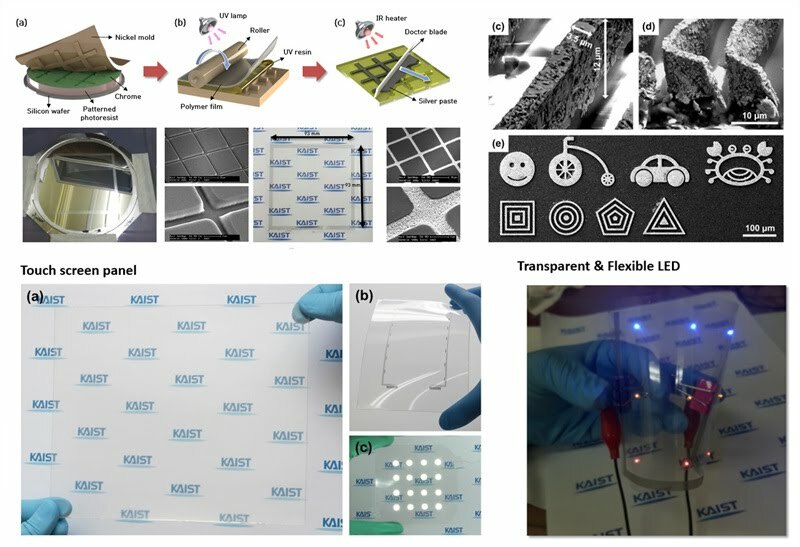 The highly elastic hybrid nanocomposite conductors and highly transparent flexible conductors can be mounted on any non-planar or soft surfaces to realize human-friendly electronics interface for future wearable electronics. LIGA is the German acronym for X-ray lithography (X-ray LIthographie), electroplating (Galvanoformung), and molding (Abformtechnik). Since a synchrotron radiation source is used in the lithography, this process is generally used to fabricate high-aspect-ratio microstructures with a thickness in the range of dozens of micrometers to several centimeters. In addition, the structures have precise dimensions and good surface roughness. UV-LIGA use ultra-violet light instead of X-ray source. Photoresists like SU-8 is used for high aspect ratio of molds. Electrospray technique has been widely used due to its uniform and fine droplets generation characteristics. The electrospray also shows excellent air purification (fine dust collection and anti bacterial function) properties when the spray liquid is pure water. However, it is extremely difficult to spray water electrically due to its high electrical conductivity and surface tension. 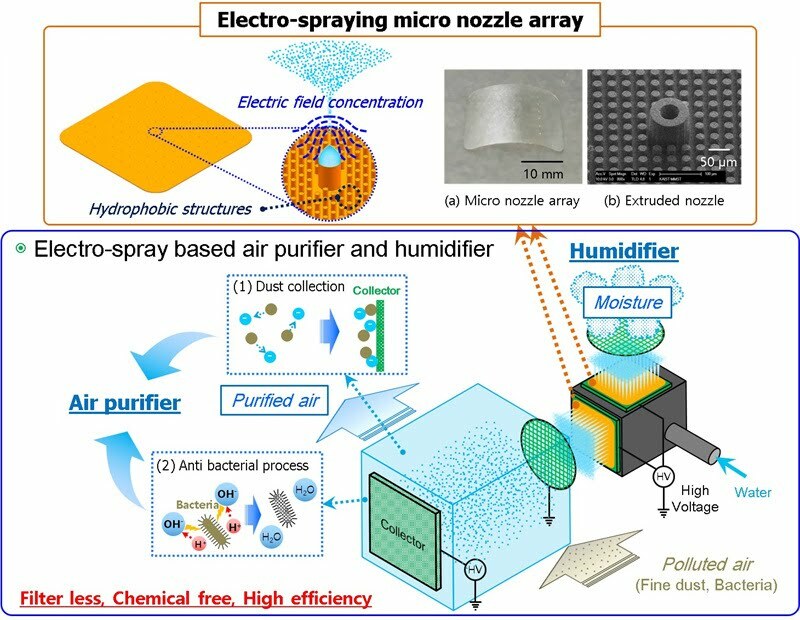 Micro nozzle array made of dielectric material is being developed to produce large amount of water nano-droplets in a stable electrospray condition. With the help of MEMS technology, high aspect ratio of micro nozzle can be fabricated uniformly and is expected to be applied in commercial air purifier and humidifier. The SAD (Safety and Arming Device) that ensures safe and reliable performance of ammunition is now often miniaturized to enable artillery fuses to be equipped with electronic devices. Although many miniature SADs have been developed using MEMS technology, most of them have been found inappropriate for actual munitions application due to the harsh conditions of use. Our group proposed MEMS-based SAD. 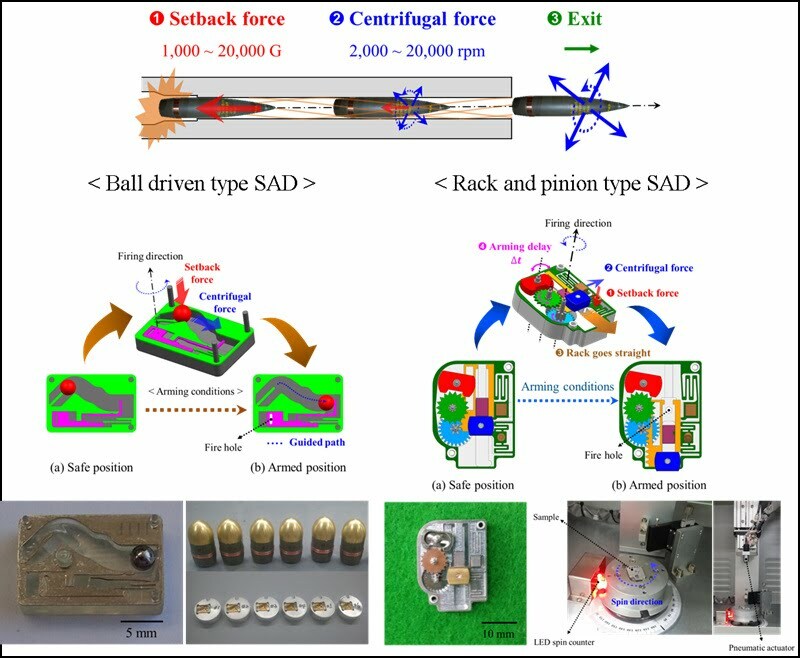 The proposed MEMS-based SADs were found to be appropriate for artillery fuses in every specific criterion by conducting environmental tests and actual field tests. Using a deep x-ray, high-aspect-ratio (HAR) 3D microstructures can be fabricated. The fabrication process consists of a vertical deep x-ray exposure and a successive inclined deep x-ray exposure. The first vertical exposure makes a triangular column array with a needle conduit through a deep x-ray mask having a triangular and hollow circle shape pattern. The column array is shaped into the microneedle array by the second inclined exposure without additional mask alignment. 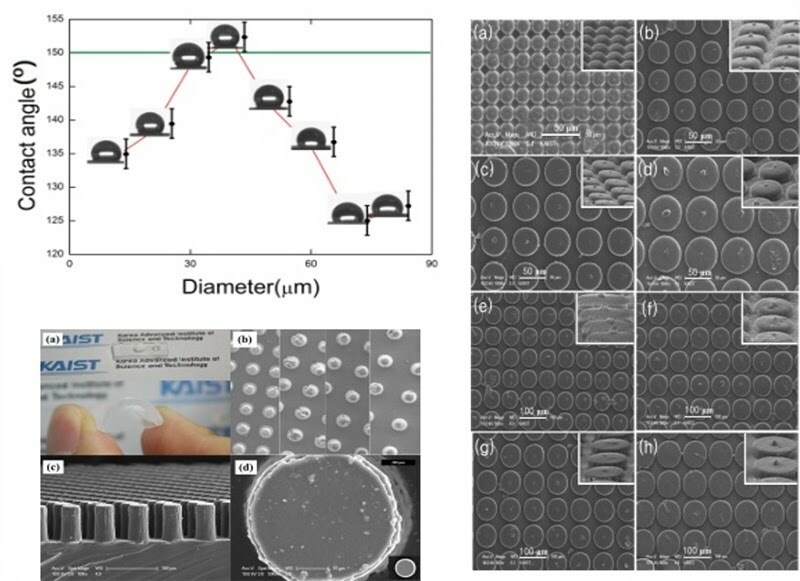 Changing the inclined angle and the gap between the mask and polymethylmet-acrylate (positive photoresist) substrate, different types of microneedle arrays are fabricated. 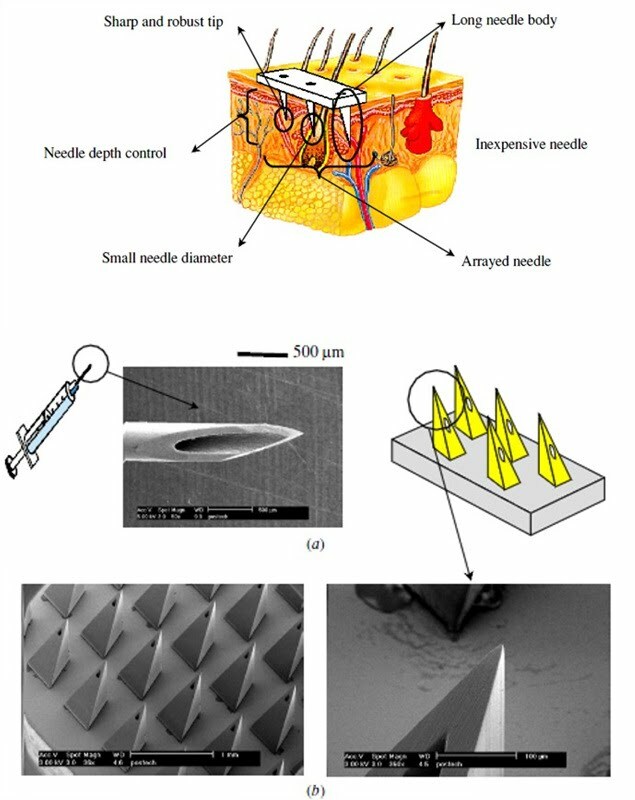 The fabricated microneedle fulfills the structural requirements for painless drug delivery and blood extraction including a 3D sharp tapered tip. Superhydrophobic materials have a water contact angle (CA) higher than 150 °C, where water droplets roll off the surface. These surfaces have special usages, such as anti-ice, anti-fog, and the creation of self-cleaning clothes, and some surfaces have both superhydrophobicity and antireflective characteristics. Mass-producible superhydrophobic surfaces with remarkably identical appearance and efficiency are obtained through a mold fabrication and hot embossing process. The SU-8 100 mold for the privacy filter is fabricated by UV lithography. After that, PDMS is poured into the SU-8 mold and later released from the mold, transcribing the pattern. The proposed privacy filter does not require any opaque materials and therefore provides maximum transparency, yielding a myriad of benefits on mobile devices given their limited battery capacity. In addition, these privacy filters with micro-cuboid arrays are suitable for commercialization and the roll-to-roll process using thermosetting resin. 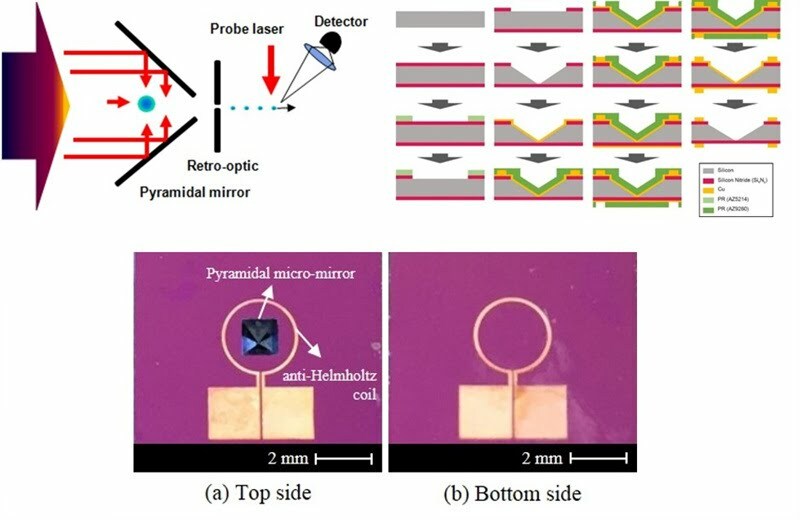 We developed the novel integrated MEMS-based platform which can be employed for measuring near-field thermal radiation between hyperbolic metamaterials (HMMs). For HMMs, Ti and MgF2 are selected for the easiness of fabrication. It was shown that near-field thermal radiation between HMMs of Ti/MgF2 is much larger than that between bulk Ti. The MEMS-based micro-devices with HMM source/receiver, heater, temperature sensors, and capacitance sensors enable us to measure radiative heat flux together with vacuum gap width. Further, 3-axis nano-positioner can freely change the distance between the source and the receiver. With this new platform, the enhanced radiative heat flux between HMMs can be measured depending on the vacuum gap width and the source temperature. The traditional magneto-optical trap (MOT) requires six laser beams and anti-Helmholtz coils. The pyramidal mirror was suggested to extend applications. We fabricated a pyramidal micro-mirror using bulk etching with an integrated anti-Helmholtz coils. Photonic nanostructures are thermally imprinted in triple cation perovskites by hot embossing. The imprinted layers are observed to have recrystallized into a significantly smoothened surface with larger crystal grain size compared to the non-imprinted rough, polycrystalline layers. 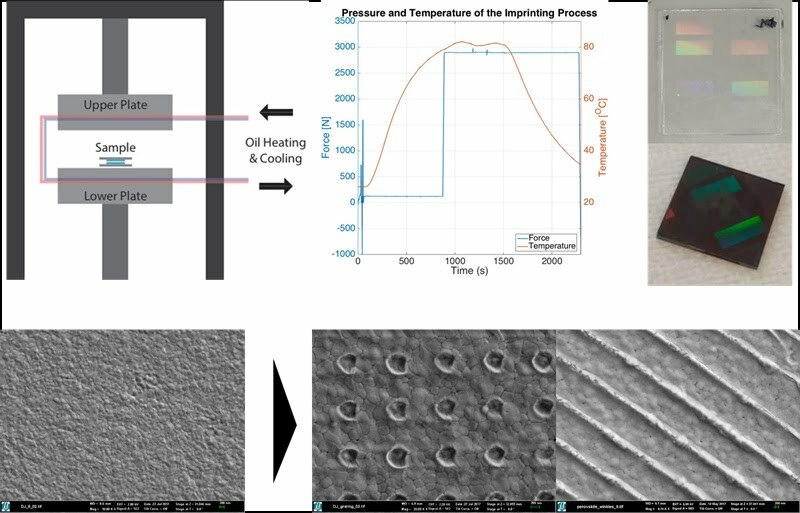 These imprinted layers show improved performances in PL and are expected to improve performances in lasing and solar cell applications. Piezoelectricity is the charge on the surface of crystals generated by external forces applied to single crystals of quartz and several other minerals. The charge is roughly proportional to the applied mechanical stress. These so-called piezoelectric materials discovered in 1880-81 by Pierre Curie and his brother Paul-Jacques. A year later, the Curie brothers discovered the inverse effect which is that an applied voltage generates a deformation of the crystal. This property of materials can be utilized for electric-mechanical actuators and sensors. Today, micro-chip devices are making major contributions to the drug discovery process. In this application, a capability for rapid high-throughput multiplexed analysis using low volumes of sample and reagent is paramount, and the microchip devices offer a convenient and cost-effective approach to this type of analytical process. As biotechnology merges with micromachining, there are three examples: miniaturized PCR, DNA chips, and immunosensors, or other example such as microphysiometers, blood gas and blood electrolyte sensors, Lab-on-a-chip.